After school Trevor C. Wells completed a carpentry apprenticeship and started to play for the Uxbridge Rugby Club. In 1976 he completed his apprenticeship. Two years later he broke his neck in a rugby accident and was paralyzed from the neck down. After that, he spent seven months in hospital. Soon after, he moved to a section for disabled young people, where he was encouraged in 1984 to start painting as a form of occupational therapy. In the same year he was awarded a scholarship by the Association. In 1987, he became a full member. This opened him up to a whole new career as a mouth painter. 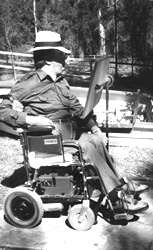 1990 Trevor C. Wells left the physically disabled department and moved to Chesham in Buckinghamshire. In 2000, he participated in the artist delegates meeting held in Sydney, where he was bestowed the great honor to be elected a member of the Board of the Association. The favorite subjects of Trevor C. Wells were landscapes, produced mostly by using the acrylic technique. The precision of his observations of nature – often by means of photographs – gave his pictures a special appeal. Especially the winter landscapes, which were among the favorite motifs of Trevor C. Wells, are notable for their skilled coloristic effects. He could exhibit his numerous works at individual and group exhibitions worldwide. Bruce G. Peardon was born on 28th February 1945 in Brisbane, Australia. After attending school, he trained as a radio mechanic. After that, Bruce G. Peardon completed his time of military service in the Navy. In 1962, he severely injured his cervical vertebra in a car accident, as a result of which his arms and legs remained paralysed. During his long stay in hospital, he got to know the mouth painters Bill Mooney and James K. Meath. This developed into a friendship and, thanks to these two artists, Bruce G. Peardon learned to write and paint by mouth. He thereby got to hear of the Association, which granted him a scholarship from July 1965 onwards. He subsequently developed into a recognized artist, which led to his becoming a full member of the VDMFK as of 1st March 1972. The mouth painter’s favourite motifs were his Australian homeland, motifs from the mythology of his country and jocund animal and child motifs. The mouth painter was able to present his works at exhibitions throughout the world. 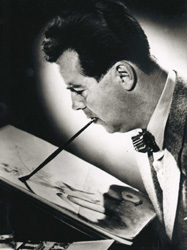 In addition, Bruce G. Peardon wrote three illustrated children’s books, which met with great success. These bore the titles: “Charlie the Chimneysweep and Sooty”, “Teddy’s Night Lost in the Bush” and “Old Billy‘s Enchanted Valley”. The books, which were published in five languages, became bestsellers. On 13th May 2001 Managing Board member Bruce G. Peardon passed away. He was elected to the Managing Board of the Association at the Delegates’ Convention on 1st April 1992 in Rome. On 21st May 1997, Managing Board member Charles Fowler passed away. He had been a member of the Managing Board of the VDMFK since the Delegates’ Convention in London in 1988. On 10th February 1995, Managing Board member Erich Macho passed away. 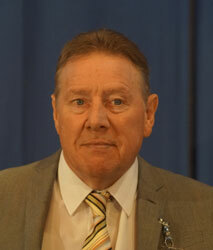 He was elected to the Managing Board of the VDMFK at the Delegates’ Convention in London in 1988. Irene Schricker was born on 12th March 1927 in Munich. Until she was 19, she worked as a clerk. Then she contracted spinal polio, due to which she was no longer able to work in her profession. 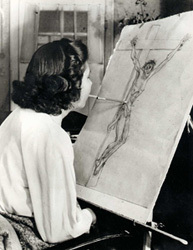 Already as a child, she had enjoyed painting and drawing. Due to her physical disability, she turned her hobby into her vocation. On 7th July 1956, she became a full member of the Association. Through untiring diligence, she acquired an extensive skill as a mouth painter in all areas of painting and graphic arts. This opened up unexpected new possibilities which helped her to overcome the disability more easily. 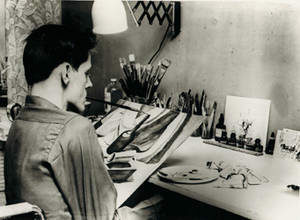 The artist worked in oils, acrylics, wax, tempera, watercolours and other graphic techniques. Within the extensive range of motifs found in her pictures, the religious themes were particularly prominent. They were often composed in the traditional form of the winged altar (triptych). In her pictorial language, Irene Schricker took as her models the styles of Medieval Art and German Expressionism. She was accorded a great honour when she was awarded the Federal Cross of Merit 1st Class of the Federal Republic of Germany. Managing Board member Irene Schricker passed away on 14th January 1991. She had been a member of the Managing Board of the Association since 1984. The full members of the VDMFK elected her to this office at the Delegates’ Convention in Johannesburg. Peter N. Spencer was born on 20th August 1924 in Wallasey/Cheshire. After school, he attended Cambridge University. Following an aircraft accident on 27th March 1945, he lost the use of his arms and hands. As Spencer had always enjoyed drawing, he took art lessons at the Art College in Wallasey. With great endurance and untiring work, he learned to paint and to draw holding the brush in his mouth. Already in 1957, he was granted a scholarship by the Association. In 1959, he was received into the VDMFK as a full member. 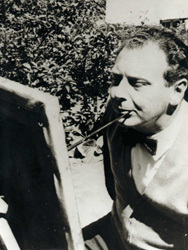 Peter N. Spencer was a well-known artist in England. 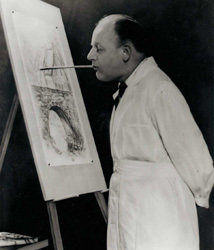 His works were exhibited in many cities in England and throughout the world. 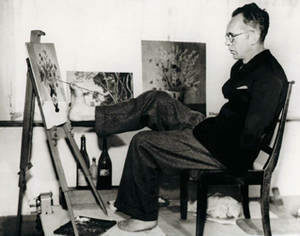 His favourite motifs were portraits and landscapes. As a former pilot, he also frequently designed motifs with aircraft. He was accorded a great honour when, in 1980, Buckingham Palace awarded him the Order of the British Empire (MBE) for his human and artistic achievements. On 7th October 1987, Managing Board member Peter N. Spencer passed away after a short stay in hospital. He was elected to the Managing Board of the Association at the General Assembly in Madrid in 1981. Elof Lundberg was born on 28th June 1917 in Sweden. He was paralysed in both arms since birth. He learned to write and to carry out important tasks with his mouth. His artistic tendencies led him to music and to painting. He took singing lessons and at the same time attended several art colleges in Stockholm. His works are characterised by three main styles: boldly coloured, expressive still lives and figures, gentle, balanced still lives in pastel shades which clearly display the influence of Cubism, and abstract compositions with more muted tones and strongly defined geometrical designs. The constructive power of his artistic gift emerged with equal intensity in these different design styles. Elof Lundberg was a founding member of the Association. Through many exhibitions, public gatherings and interviews on the radio and in newspapers, he was skilful at raising public awareness of disabled artists. Managing Board member Elof Lundberg passed away on 4th April 1986. He had been a member of the Managing Board of the Association since 1971, when he was elected at the Delegates’ Convention in Barcelona. Charles Pasche was born on 11th October 1915 in Céligny near Geneva, with no arms. In school, he learned to write the first letters of the alphabet with his right foot. Charles Pasche attended an Art College near Geneva. He developed into a recognized artist, with a dexterity in his toes which exceeded that of many fingers. Everyone was astonished how surely he could work with his feet at the writing and drawing desk. Charles Pasche particularly liked painting still lives with flowers and the magnificent Alpine landscapes of Switzerland. He was able to present his works at numerous exhibitions in Switzerland and throughout the world. On 13th September 1981, Managing Board member Charles Pasche passed away. He had been a member of the Managing Board of the VDMFK ever since the Founding Assembly of the Association in 1957. Eugen Pirard was born as a healthy child on 21st July 1911 in Verviers. In 1919, he contracted spinal polio, which caused him to lose the power to speak and to see. It took months before he recovered his sight and his speech. In 1921, Eugen Pirard managed to take his first steps and, in time, began to walk almost normally again. However, his arms and hands remained permanently paralysed, so that Eugen Pirard instead used his mouth to carry out activities. Eugen Pirard attended the Art College in Verviers for seven years. He painted mainly landscapes, particularly forest and moorland motifs. He was one of the founding members of the Association. 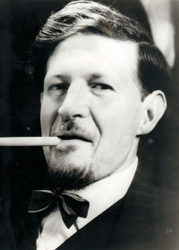 Eugen Pirard passed away on 23rd January 1971. He was elected a member of the Managing Board of the Association at the Delegates’ Convention in 1965 in Toronto. 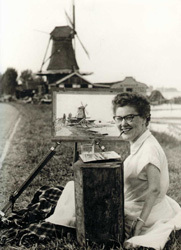 Corry F. Riet was born as a healthy child on 16th November 1924 in Zaandam. At the age of five, Corry F. Riet contracted polio and from then on remained paralysed in her arms and legs, which meant that she was permanently confined to a wheelchair. She spent her school days at the School for Invalids in Rotterdam and afterwards lived in Amsterdam. She taught herself to paint by mouth and loved to create romantic landscapes on paper. Not until 1944 did she return to her home village Zaandam, a suburb of Amsterdam, where she bought a house and often sat at the corner window to observe the hustle and bustle on the street. She also greatly enjoyed travelling, which took her to many different cities throughout the world. She had an enormous zest for life and everyone who spoke to her could feel it. Corry F. Riet passed away on 11th November 1958. She was thus a member of the Managing Board of the Association, to which she was elected at the Founding Assembly of 19th March 1957, for only just over 1 1⁄2 years.